Sthebiso Mkhize and Sabelo Bhengu ready to start new lives. 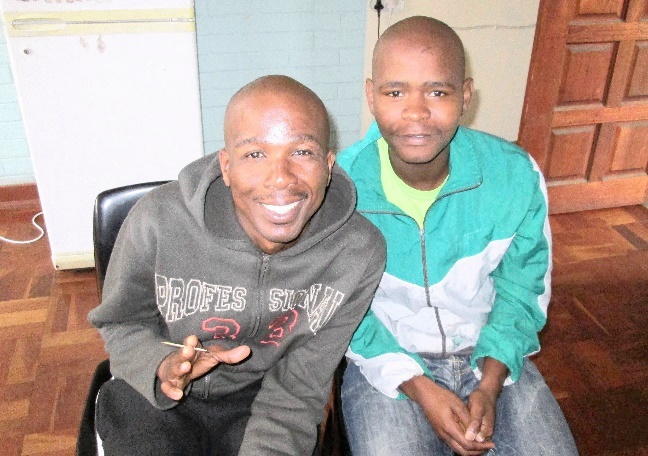 Sthebiso Mkhize and Sabelo Bhengu, former whoonga addicts, are delighted to have completed a 12-week programme of rehab at the Newlands Clinic, as part of the Qalakabusha (“new beginning”) programme coordinated by the eThekwini Municipality and a number of NGOs including the Denis Hurley Centre. Sthebiso and Sabelo and nine other young men who completed the rehab programme with them, are keen to find jobs as soon as possible so that they can remain “clean”. Fr Stephen Tully says of these eleven: “We know them and together with the staff of the Newlands clinic, can vouch for their rehabilitation. Few employees come with this kind of recommendation.” If you are able to help with employment opportunities, please contact Fr Stephen on 031 306-3595 or Ishmael Chishanu on 079 024-3417.